Although I love treating myself every now and again, there are many high street gems that cannot be beaten both in terms of price and quality. It can hard to find them in the aisles through all the hustle and bustle of the high street, but today I thought I'd give you a short but sweet round up of my top current budget picks. NYX is one of my favourite brands on the high street as I've never been disappointed by one of their products yet. The Ombre Mauve Me Blusher is no exception and is made up of two shades to add a neutral hue to the cheeks - perfect when you would like to add a soft flush to your face. As someone who loves illuminated, radiant skin, the Bourjois Java Rice Powder is a great find as it highlights in just the right places, whilst minimising the appearance of pores and setting my makeup to make it last longer. I've recently rekindled the love with Topshop makeup; an old favourite of mine that has a range of lipsticks, blushers and highlighters to tickle your fancy. Their Glow Highlighter is super creamy and dewy looking, whilst their Powder Blushers are incredibly pigmented and easy to use. The Sleek Face Form Palette was the first product I reviewed on my blog and since then it has remained in my collection, being one of my long term favourites. With the rose gold blusher in with the contour and highlighter powders, this nifty palette is great at suiting all of your sculpting needs. 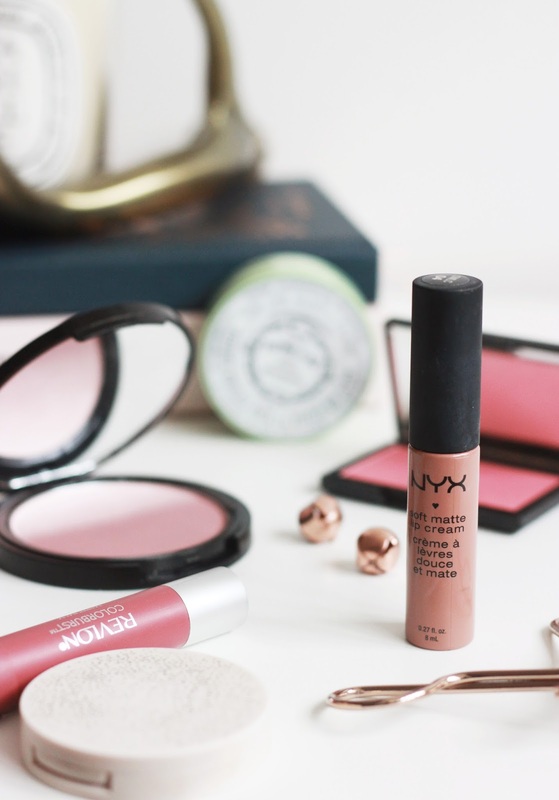 I couldn't not mention the NYX Soft Matte Lip Creams in this round up, as their creamy formula and comfortable, matte finish make them one of, if not my favourite lip pick from the high street. With an array of colours, they've got shades for every occasion, but London is my current top offering at the moment. If a product is marked with * it is a PR sample. This post contains affiliates.